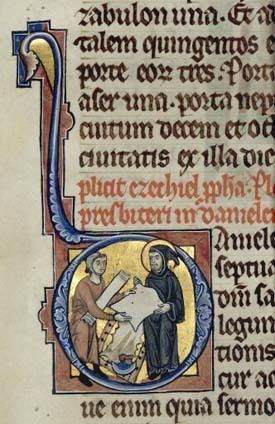 This historiated initial from The Hamburg Bible, in The Royal Library, Copenhagen, shows a parchment maker handing off his product to a Benedictine monk. Note the stretcher in the background with the lunellum knife. There’s a lot of information at Khan Academy’s website, but if you watch these three short videos, you’ll probably know as much as you’d ever feel you needed to. This second video takes you quickly through the material contained in the first one, but is mainly about the subsequent steps in the making of a book. In the third video Erik Kwakkel describes two parchment types, as well as providing fascinating information about the books he’s discussing. 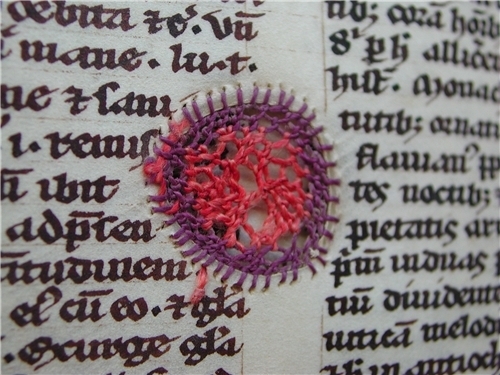 The Khan Academy site has a good piece on parchment, including material on flaws and holes, which would often result from insect bites to the living animal. The scar tissue would dissolve during processing, and if the book in question wasn’t the most expensive, would just be written around by the scribe. This picture shows such a hole which nuns have neatly darned!